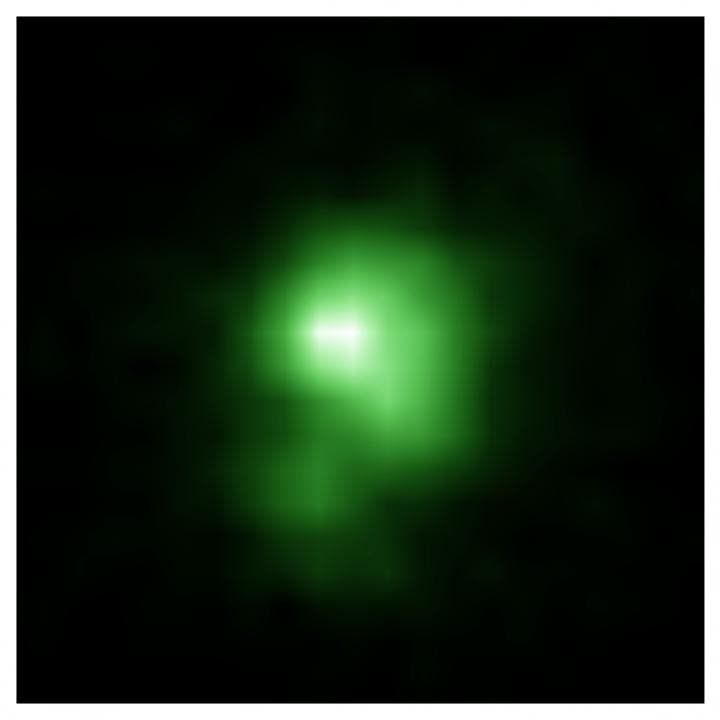 The green pea dwarf galaxy shown above "appears to be an excellent local analog of the numerous dwarf galaxies thought to be responsible for the reionization of the early universe," said University of Virginia astronomer Trinh Thuan. "The finding is significant because it gives us a good place to look for probing the reionization phenomenon, which took place early in the formation of the universe that became the universe we have today." Using data from an ultraviolet spectrometer aboard the Hubble Space Telescope, the team discovered a nearby compact dwarf galaxy emitting a large number of ionizing photons into the intergalactic medium, or the space between galaxies. Scientists believe those photons are responsible for the universe's re-ionization. The Hubble Space Telescope image above shows the green pea galaxy J0925+1403. The diameter of the galaxy is approximately 6,000 light years, and it is about twenty times smaller than the Milky Way. In the period of several hundred thousand years after the Big Bang, the universe was so hot and dense that matter was ionized instead of being in a neutral form. But 380,000 years later, the expansion of the universe had cooled it enough for matter to become neutral and for the first structures of the universe to form – gas clouds of hydrogen and helium. Gravity then made these gas clouds grow in mass and collapse to form the first stars and galaxies. 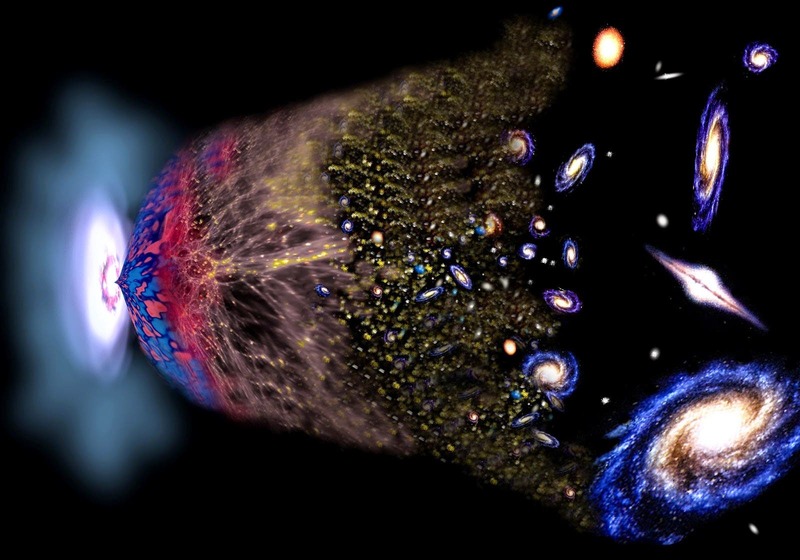 Then, about one billion years after the Big Bang, another important transformation occurred: the universe reheated, and hydrogen – the most abundant element – became ionized for a second time, as it had shortly after the Big Bang, an event which astronomers call "cosmic re-ionization." How this happened is still debated. The international team of scientists, organized by Trinh Thuan, has largely validated that hypothesis in a paper published Thursday in the journal Nature. Trinh's research colleagues on the paper are at institutions in Ukraine, the Czech Republic, Switzerland, France and Germany. To solve this problem, the international research team proposed to observe "green pea" galaxies. Discovered in 2007, these galaxies represent a special and rare class in the nearby universe. They appear green to light sensors and are round and compact, like a pea. They are believed to host stellar explosions or winds strong enough to eject ionizing photons. Using Hubble's UV radiation detecting capabilities, the research team found that the "green pea" galaxy J0925+1403, located at a distance of three billion light-years from Earth, was "ejecting" ionizing photons, with an intensity never seen before – about an 8 percent ejection. This fundamental discovery shows that galaxies of this type could explain cosmic reionization, confirming the most commonly made hypothesis for this phenomenon. "As we make additional observations using Hubble, we expect to gain a much better understanding of the way photons are ejected from this type of galaxy, and the specific galaxy types driving cosmic reionization," Trinh said. "These are crucial observations in the process of stepping back in time to the early universe. They paved the way to future observations with the successor of Hubble, the James Webb Space Telescope, planned for launch in 2018, which is expected to revolutionize the field with updated capabilities for detailing the first galaxies and sources of cosmic re-ionization."